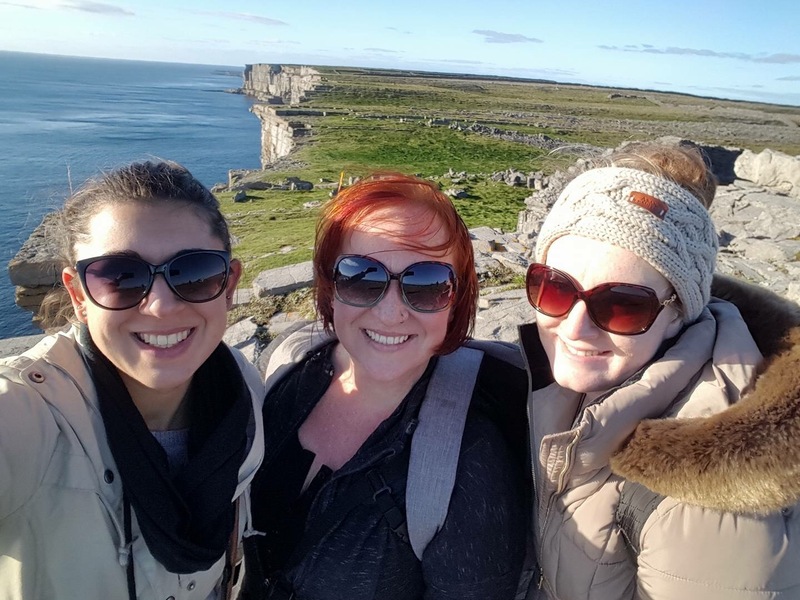 This morning was somewhat the same as yesterday; we were to head to our next destination–the Aran Islands, more specifically the biggest of the islands–and be on the tour bus for a bit. About an hour, I believe. It was until we got on the ferry, when I was pulling out my phone from my pocket and instantly knew it fell out of my pocket and got left on the bus, the day turned completely upside down. Like any other person, I was freaking out as I was checking the aisle way of the ferry, the deck outside and the walkway. Nope, I knew it had to be on the bus. Thanks to Emylee, she was able to see my phone being tracked as a green moving dot along the road of Connemara on her Galaxy phone. Apparently, you need to find a special way to track an iPhone device on a Samsung one because Samsung won’t track another device unless it’s another like theirs. I wouldn’t be surprised if Apple had some regulations like that too. Anyway, because of my lacking of a phone in hand, I was a bit blue while on the forty-five-minute ferry ride to the island. Mostly, because I couldn’t take snapshots of the beautiful sights we saw today. I had my digital camera, but it’s ten years old so it has its limitations in capturing shots. But I was instantly perked up when I smelled the sea air and seaweed on the dock. Then there was the coolness of wind kicked in, thank God. This was the weather I was waiting and prepared for. I didn’t even care that I got a slight wind burn on my nose, lips, and chest (I saw the imprint when I changed my shirt). Then my mood dimmed a little when I found out, for the root to take thirty minutes to one of the major landmarks on our itinerary, we had to rent bikes to get there. But I thought for a moment, “Why not? It could be fun and a change of pace.” And oh dear God, it was a change of pace. First, the bike was awkward to ride for a bit; the seat was too high (had to lower that). Then, when I went slightly uphill it took too much energy, I just got off the bike rather clumsily and walked it up to the convenient store. It was ridiculous. So then I asked Emylee to help readjust the bike. As we got to pedaling for a while, it was smooth and okay. After about twenty minutes into the ride, the bike seat and the pedaling took a toll on me from the waist down. Long story short, already I knew I’d get bruises and indentations on my inner thighs and my lower rear. Ow. I guaranteed I’d be feeling it the next day. Another perk from the nuisance of using the bike was that we made many stops to take pictures during the first half of trail ride. There was a spectacular view of the Atlantic and the island’s edge from every angle. Incredible. In fact, one major stop was the beach. We took our time here. We even made our literal mark in the sand. Voyagers’ Pen. Our names were also in the sand, but I couldn’t get a good shot with my digital camera; mostly because I’m too short, I wasn’t able to lift the camera high enough to get everything written in the sand. But Moriah emptied a water bottle to put some sand and shells in for safekeeping. Oh, and there were beautiful mares, tricolored cows, warm brown donkeys, and a dog. What appeared to be a stray, yet beautiful, Border Collie was following us and other tourists throughout the day. He, or she (I couldn’t tell), had the classic look of an all-black coat with a thick white collar and pelt. The animal was super friendly and responsive. So adorable. Then when the dog drifted to another group, we came to what we considered our halfway point: Dun Aoenghasa. For two euros, we hiked a twenty-minute walk up to the structure. It turned out, the stone structure was a prehistoric ruined site that early islanders built as an intimidating fortress against outsiders. I didn’t doubt it for a second considering how high we were and how big the drop of the cliffs was the fortress used as their walls. After recovering whatever little energy we had, we hurried back, sometimes walking the bike instead of riding it (because I was just to sore to put it delicately), by 4 p.m. And even paid a visit to a white and dark brown, and rather large, pony. It was very curious and was sniffing around, especially Moriah. Maybe because she just finished eating an apple. However, it welcomed our petting and attention and gave us a bug-eyed look I considered as a silent goodbye to us. We went to the convenient store to get a little something to hold us over (we haven’t eaten technically since 8:30 this morning). I got a few cheap things with a cappuccino. One of those was Jacob’s Caffe Di Milano hazelnut cream wafers. And, oh my god, they were one of the best cookies I’ve ever had. I haven’t had a sweet like that, where it was good with well-made ingredients, in so long. It made up for the soreness that formed while on the ferry. Just wanted to put that out there. Once we got back on the mainland, we took the second bus back to Galway. An hour passed and, when we got off, I asked the driver about my phone and he said it was at the Lally Tours tourist office. I was so relieved that it didn’t bother me that much that they were closed by the time we arrived at their door. We got a replied email saying my phone was in good hands and that I could pick it up tomorrow. Now I’ll be heading back to my new room that was arranged (in order to stay at Savoy Hostel). This hostel is just so nice that we’d compromise to anything; even switching rooms and separating. I like my clean, dry bed and that I get to have personal multiple outlets (on my bedpost) all to myself. Tar éis lá fada, oíche mhaith, guys. After a long day, good night, guys. We were on Quay Street for the duration of window shopping. And just to put out there, by chance, I swear I had the best vanilla latte ever. This may be profiling or assuming a certain stereotype, but it was made by the Italian shopkeeper of a Galway souvenir shop. Just saying, I think because of him, I think there was a huge difference. And finally, in a corner, we went into Saint Nicholas Collegiate Church. was a high towered, Gothic structure with three major arched stain-glass windows. Simply too beautiful to describe in words. I lit a candle for my grandmother, Berneda Nofziger who passed away at the ripe age of ninety-four. She was a trooper who had a sharp mind. I have no shame in saying that I was particularly set on seeing that church solely because it’s named after the legendary figure known as Santa Claus. Christmas is my all-time favorite holiday hands down. Which on that subject, I keep forgetting that Thanksgiving is only celebrated in the United States. So naturally, once November 1st hit, the Christmas decor went up here in Ireland. I love it. In fact, I’m listening to Christmas music as I write. It’ll be a rather dull day since it will be travel day tomorrow. But I’ll put some interesting stories on here should they occur. Today had the label, Travel Day. A somewhat slow morning, we had an 11 a.m. train ride back to Dublin. It was quiet, steady, and a good time to catch up with anything I had put off or was too exhausted to do. At about 2:30 p.m. we arrived at Heuston Station then hailed a cab the airport. The cabbie was an O’Reilly and had a sort of paternal grandfather appeal to him. He was friendly, informative, yet a man of few words and laughs. We got there in about 15 minutes and went straight to baggage check, only to be told we couldn’t check in for another hour. Apparently, you can’t check in more than three hours till departure. So in the meantime, we had McDonald’s. I saw it in the food court, and instantly I craved chicken nuggets when I saw their advertisement. When the hour was up, we thought to stuff our bags in plastic trash bags in order to keep all straps together in one piece without any issue. Like every other airport process, we waited off and on for those three hours–we were to depart at 6:40 p.m.–and then boarded the flight. Only instead of the plane connected with the platform, we headed outside and climbed the RyanAir’s stairs like some Kennedy. There’s a first time for everything. An hour later we arrived in Edinburgh. Once we claimed baggage, I had an ATM swallow a hundred and thirty bucks for just over a hundred British pounds sterling. Naturally, we got a rather large taxi to Castle Rock Hostel. Then to our dismay, we searched for last minute dinner. For those who don’t know, everything (from Dublin to Edinburgh and in between) was practically deserted after 6 p.m. But after asking around, we got some luck handed to us and ate at Civerino’s who was still serving pizza. This was another moment where I had the best of something–I swear to God everything here in Europe is so much better than in the States. And not for a bad price either considering the currency exchange. We each paid 4.50 (that’s about $6-7.00) for a third of a 14-inch pizza. Finally, we ended the night with getting some great advice, from a Canadian living in here in Edinburgh, about finding the more unique, more authentic Scotch Whiskey in Scotland: find it in their grocery stores or convenient stores like Tesco. Now I bid thee goodnight. Yes, that was a bit sarcastic and haughty of me. The morning started like this: with the time to meet was misunderstood, as Emylee emphasized, lacking confirmation and proper information, these all caused us to miss the Quest for the Holy Grail tour. To put in broad, yet expanded terms, there was no travel voucher in our email. The only confirmation we’ve ever received was of payment from September when we booked it. 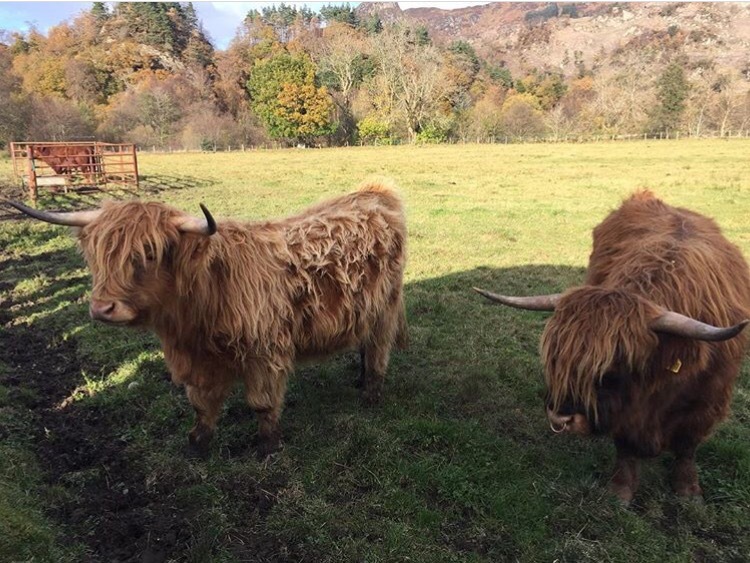 To know anything of where to meet, we had to look up the place on the Scotland tours website. Emylee made it clear that this was considered terrible customer service (look below in Emylee’s part for expansion). So with a limited option, we reluctantly booked a tour for tomorrow to two other destinations (not remotely the same as our original tour) with Stirling Castle. Then we did some actual retail therapy. Needless to say, it helped. A lot. Though my card kept acting up, I bought, for 28 pounds, a 100% cashmere scarf for Mom, a lambswool one for me, for 8 pounds, and a few little trinkets for a few people. 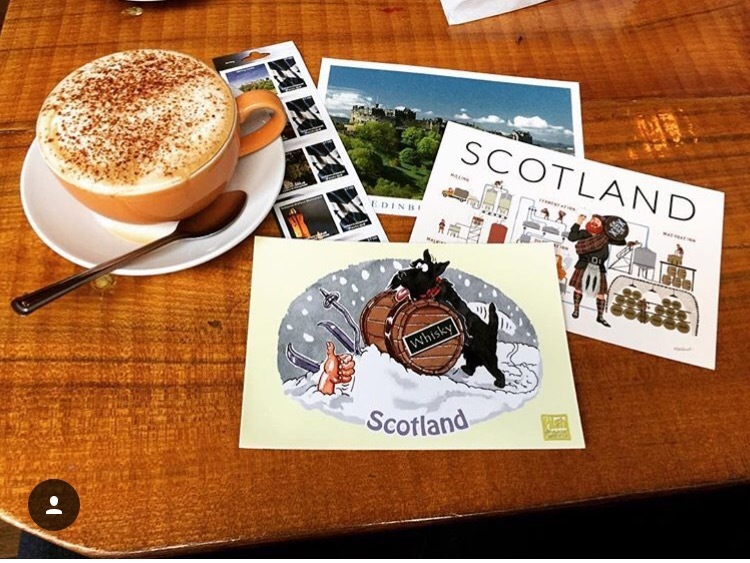 Then we took a short break at the Saint Giles Cafe & Bar for some cappuccinos, a couple little platters, and I wrote on some hilarious postcards. Once finished we headed to the Greyfriars Bobby Statue and took a short detour to the cemetery across the street from the memorial (and a pub named after the little Skye Terrier). I can only say that I felt the intense stillness of those sacred grounds and the need to not disturb it was emphasized in the air. Then we went toward the infamous Royal Mile to climb Granny Green’s Steps and stand at the courtyard entrance to the eight-centuries-old fortress that sits on a hundreds of millions-year-old [extinct] volcano: Edinburgh Castle. This place was worth the 16.50 pounds; the only way I can describe as much as possible is through extremely short sentences. Stone. Cobblestone. Hills. Steps. Bricks. View. Edges. Wind. Cold. High. Arches. Knights. Arms. Torches. Towers. Battlements. Wallace. Stain Glass. Painted Gold. Red Velvet. War. Uniforms. Museums. Chapel. Margaret. Grand Hall. Lions. Horses. Tudor. Stewart. Blocks. Gargoyles. Square. Governor Quarters. Prison. Dungeons. Barracks. Rod Iron. Gates. Scots. Honour. Crown Jewels. Mannequins. Stories. High Kings. Macbeth. Charles I. Antechambers. Marble. Mantles. Medals. Relics. Flags. Kilts. Dirks. Swords. Rifles. Pistols. Plaid. Re-enactments. Photographs. Paintings. Red. Black. White. Blue. Ropes. Glass. Faded Signatures. Memorials. Pamphlets. The following above is what comes to mind and reflects in the pictures I snapped for now. Should I have any more that pop out, I’ll be sure to add them. To end the night, we decided to take another stab at eating in Deacon Brodie’s Tavern. We got a spot by an open window (to keep things circulating from what a waitress had told us) and had some tea. I decided on some good old-fashioned baked macaroni and cheese. It came with garlic bread, and this meal too went beyond the American standards. I fear my appetite will be changed forever once I leave for home. Now moving on from that slight melodramatic moment, outside the tavern the weather lived up to its stigma: cold and rainy. Moriah and Emylee needed something to remedy their sniffles so we found Tesco, got some medicine, and then just stayed in for the night. Rather than take a spontaneous, walking tour, we tapped out and caught up with our writings. Slàinte! Mòr Albannach! Cheers! Great Scot! Today was the day of our replacement tour today. Awesomesauce. Look, I just want to put it out there that I had a good time today; but I know I would have had a fantastic time with the other tour seeing Rosslyn Chapel and Dunfermline Abbey with Stirling Castle (which was what we saw today). But anyway the tour started early with check-in around 8:40 at the Cafe Nero. We were assigned to Michael as our tour guide. And let me tell you now because you’re going to hear a lot about him, he is a prime example of the stereotype that the Scottish are superb storytellers. You’ll hear plenty as you read. On Scottish roads as windy as the Irish, we came to Loch Lomond in less than an hour. 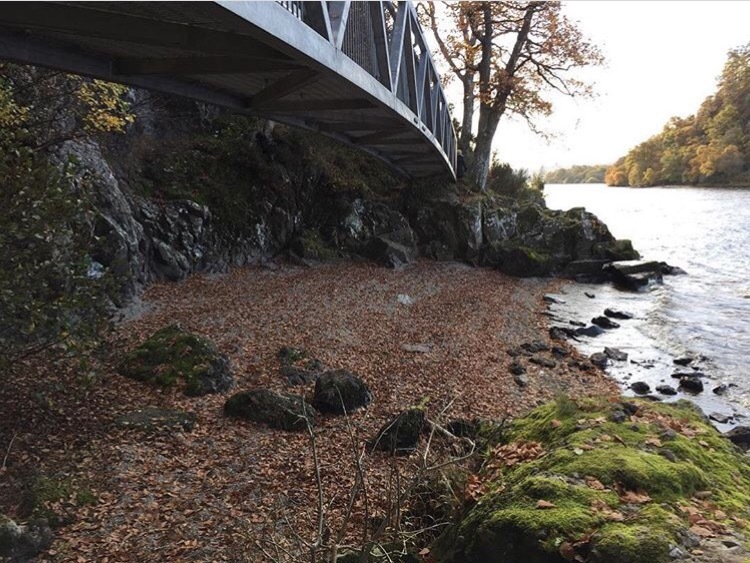 Though not as infamous and large as Nessie, the loch was still impressive and beautiful nonetheless. Just as cerulean as the waters off the coast of Inishmore or Inis Mór. 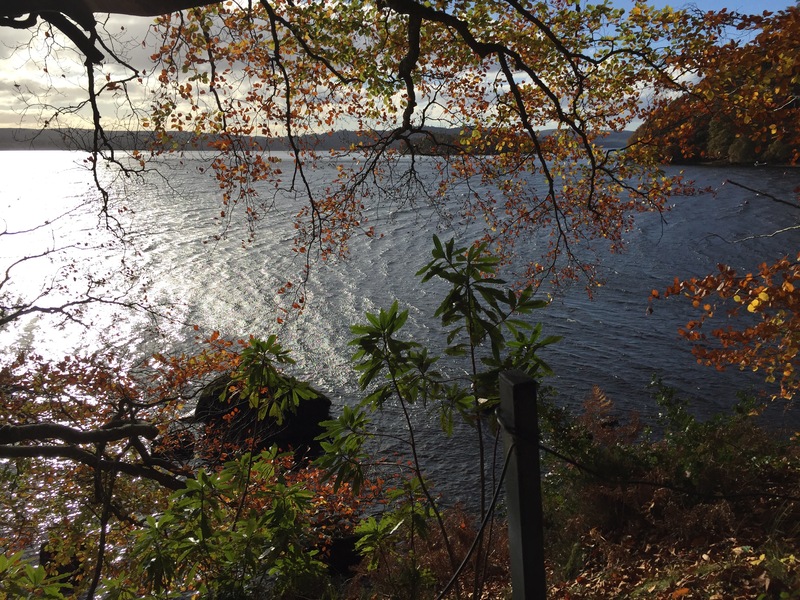 There was a great breeze while we were there and the small town, Balmaha, that occupied along the loch, had a hiking trail framed by graveled edges. That town also has a population of 28. I’m not kidding. Just wanted to point out how small exactly this city was. To the next spot, we were told a story about the love of two brothers, based on a song, that I can’t recall, that played on the bus radio. It was about the capture, bargain, and the life and death of these two brothers in consequence for going against the English in the Jacobite Rebellion. Michael said that they were given a choice while imprisoned; they either decide which is to be killed and goes free or they both die together. The brothers surprisingly chose to fight to the death, and one lived while the other died in a pool of his blood. But in spite of how tragic and selfish that sounds, these brothers had an understanding between them when it came to life. You see, the brother who chose to live had a note in his pocket (I believe it was his brother’s jacket he took to find the note), and it said, “If you take the high roads, I’ll take the low.” Two lives shouldn’t have been wasted on the count of one, in their eyes. So what that note meant was that the one who lived would roam the Highlands and the one who died his soul, as a faerie spirit, would roam the Lowlands. Michael emphasized that Heaven was the Highlands and the Lowlands for the Scots back then and that when you died, your spirit became a faerie. They believed in that very much and the superstitions that came with the legend. How romantic and glorious to imagine, huh? That next spot, which we first believed to be a whiskey distillery, turned out to be a surprise for this tour: for the second destination, we had two choices, where one would be a whiskey distillery tour and provided a drink, and the other option would be a popular film/entertainment stop on a castle’s grounds. Obviously, my friends and I with the majority of the bus chose Doune Castle. 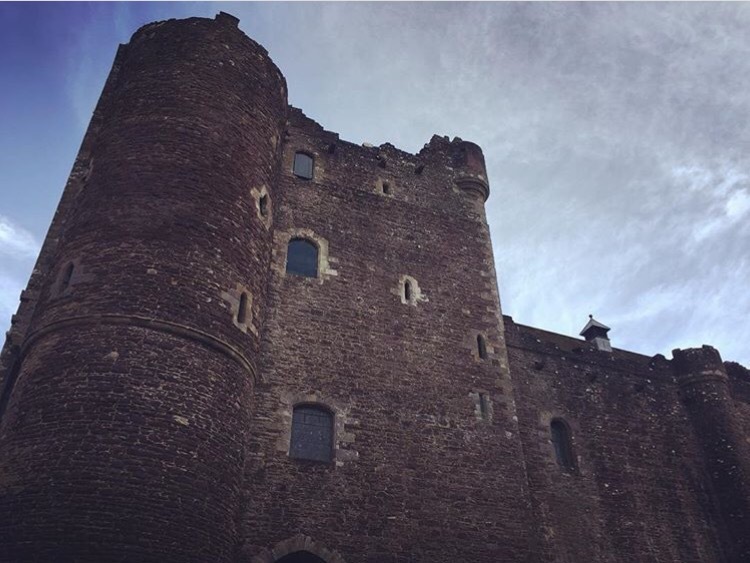 Especially since we were told that stone defense was the very place that filmed the first season of Starz’ Outlander known as Castle Leoch. And also the spot where the first episode of Games of Thrones was filmed as the Castle of Winterfell. We walked through the MacKenzies’ Great Hall, ducked through Mrs. Fitzgibbons’s kitchens, and grazed on the grounds that resided the stables and the courtyard. 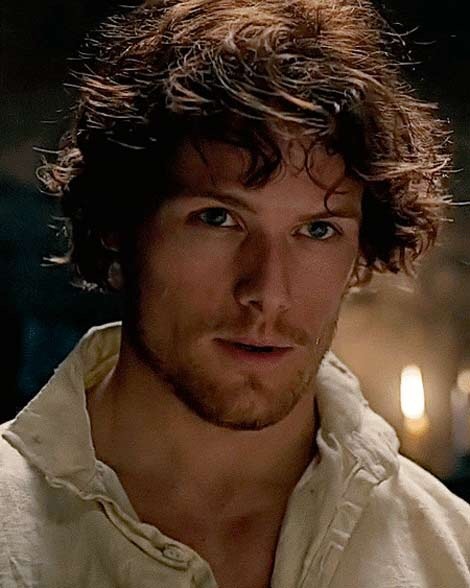 Let’s just say it was everything I hoped it would be and more, considering Sam Heughan was guiding you, murmuring tidbits in your ear (through audio guide headphones). After an hour of being “on the set”, it was time to ride the bus to the final destination. For those of us, just about all, who didn’t check out the distillery, Michael transitioned from fact to fact on how to properly drink whiskey: First, take a drink, let it sit for a second or two on your tongue then swallow to numb it and your throat for a few seconds. For the next sip, put a drop or two of water, hold it on the tongue and do the same with the second sip of whiskey (as you’d done the first time). He said if you follow this, you can truly appreciate the difference and taste of quality and cheap whiskey. As a side note, I’ve been having issues with my debit card the last few days. But I won’t go further into detail since it was finally taken care of, after being on the phone for twenty minutes in the Stirling Castle gift shop. By mid-afternoon, we rode up the long stony lane entrance of Stirling Castle. Throughout the drive, our tour guide was trying to persuade us that this castle was far more encapsulating than Edinburgh Castle. And as much as I enjoyed his tourism, I made that comparison and decided to take his word for it, because Edinburgh just has nothing to compete with. Don’t get me wrong, Stirling had spectacular views and stepping along the stone fortress walls was nothing short of accelerating. But I repeat, Edinburgh has the latter in favor regarding exposure, exploration, history, and beauty. We got back to Edinburgh within two hours and dusk had already passed. We got back to the hostel to recharge and clean up and went to dinner. As a spur of the moment, we decided on a late tour going to the rather gory and dreadful points and spots in history. Before the tour, we had enough time for a finger or two of whiskey to warm us and more importantly release some anxiety caused by what we’d be walking into on this night tour. After a few minor, very public stops, our guide for the night, Stefanie, took us to the vaults. These underground vaults were closed up for a couple of hundred years until upon discovery by a restaurant owner attempting to be handy (as our guide put it) about thirty-five years ago. These stone vaults instantly felt stuffy, musty, dang, and enclosing. Despite the fourteen other people walking with me (two of them being obviously Emylee and Moriah), I never felt more crowded, or invaded, of personal space than when I was down there. It was as if all those occupants that used to reside there hundreds of years ago were still there sucking up whatever air was remaining and feeling the body heat of others magnify. When you know that you’re visiting a haunted place, paranoia always comes in tow; however, as calm and steady I was, my heartbeat never stopped beating rapidly throughout that, what felt like, too long of a tour. I won’t even go into detail how one of the freaking spirits tried to take my headphones from my bag. We all were a little shook up like the average person would be after that kind of experience. But we wanted to do it and overall it was fun and fascinating. Disgusting and nerve-wracking, but fun.